Tustin Plumbing, Heating and Air Conditioning can deliver prompt, expert, efficient service for all your heating and air conditioning system needs. Our technicians, highly trained in all the latest techniques and equipment and fully licensed and insured, can deliver whatever service you need, from installing new systems, routine maintaining, to troubleshooting and expert repairs. They service every make and model they install, and can provide top-quality service for both residential and commercial systems. Properly installed and maintained heating and air conditioning systems provide comfort for your family, co-workers and customers, but it's often difficult to know exactly what system will best meet your needs. An expert team from Tustin Plumbing, Heating and Air Conditioning will evaluate your building and its uses to help you evaluate your options in finding the most energy-efficient and cost-effective solution. Once you've chosen a system, they can handle every stage of the process, from installation, testing, and setting up a maintenance schedule, to get your new system quickly running to provide year-round comfort. We treat every job as important -- whether routine maintenance or complex repairs or installations and we stand behind our work with a strong guarantee. We are also available round-the-clock, 7 days a week, to meet all of your heating and air conditioning needs. 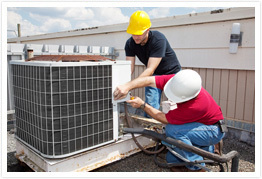 We can also repair and provide needed maintenance services for any heating or cooling systems, whether new or existing. Tustin Plumbing Heating and Air Conditioning technicians are trained and equipped to handle furnaces, air conditioning systems, heat pumps, hot water heaters, swamp coolers, rooftop units, ducting and whatever -- motor, compressor, condenser, filter or anything else needs attention in your HVAC systems. Our 24/7 emergency service extends throughout Orange County.